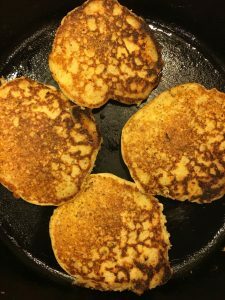 These sourdough pancakes received Sue’s highest marks so far. Generally speaking, Sue does not like sour pancakes, nor pancakes that are too heavy and these golden, crepe-like hotcakes were light and delicate. 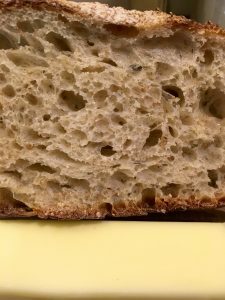 I can’t tell you exactly how I made them because as is my practice I made up the recipe. 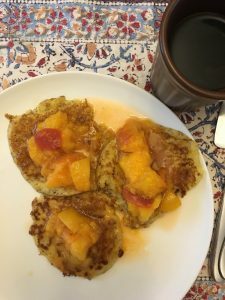 I had extra starter from another bread I was making and was in the mood for pancakes because it is peach season. In addition to starter I added a considerable quantity of cornmeal, the remainder of our quart of buttermilk (about a cup), flaxseed meal, the spent mash from my soymilk maker (called okara), a pour of vegetable oil, more nonfat milk when the batter was still two thick, two egg yolks, and two beaten egg whites. The advantage to recipe-free cooking is the freedom to improvise and feel creative, even accomplished when dishes exceed expectations. The disadvantages are obvious. How do you recall for a later date, or pass along to a friend, a recipe that calls for a considerable quantity, about a cup, and unknown amounts of meal and mash? How, for that matter, do you know what went wrong when a combination bombs? And what does my cooking style say about my larger defiance of conformity? How does a food receive kosher approval? For some items, like the prohibition of pork, the Torah is comparatively clear. But what about a more modern food like Jell-O which contains gelatin, a substance derived from forbidden bones and hides of animals, but has been turned into a chemical that no longer has much, if any, relationship to its origin? Some rabbis would give Jell-O a kosher stamp. Now, what if the hide used to make the chemical called gelatin was a pig’s? 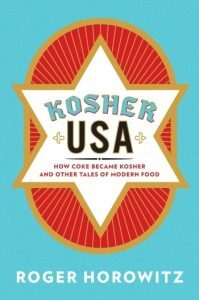 Kosher USA if nothing else is provocative and at its best points to centuries of rabbinic debate still alive as food becomes more and more processed. Horowitz’s academic style and heavy emphasis on the political interplay of corporations and rabbis are sparsely balanced by personal anecdotes, which in many instances, are more captivating than the long passages of textbook-like replays of angry letters between generally conservative rabbis supporting modernization and orthodox rabbis insistent upon glatt kosher laws that adhere to Torah but are indifferent to animal suffering or worker rights. 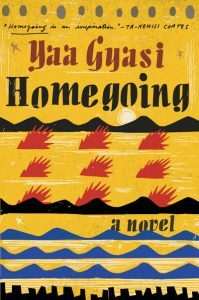 Gyasi uses her own experience as a Ghanaian American to create an original tale of history. We are asked to follow the descendants of one family member captured in northern Ghana, sold to the British, imprisoned in the Cape Coast Castle and shipped to the United States as enslaved chattel. The other continues residence in Ghana under the curse of the ancestors. While the raw brutality of enslavement is on full display, the remaining lives in Ghana are not to be envied. Over the centuries, Ghanaians capture neighbors and sell them, they fight off British overlords, barely, and are trapped by superstition and custom. Alas, Gyasi, a very young writer, has bitten off more than she can regurgitate in such a short novel. Trying to cover two continents and all the generations encumbered by nearly three centuries means the recounting of too many stories that feel just a bit familiar: an aborted ride on the underground railroad, a slave whose back is scarred beyond recognition by whippings, the Middle Passage is inhumanely sickening. The stories from Ghana are of course newer for us, but their brevity makes many of them too shallow to appreciate. Maybe the tenth in the series of mysteries for Chief Detective of the Quebec Surete, Armand Gamache. Having recently retired to Three Pines, now former chief Gamache is asked to locate artist, Peter Morrow, wife of Clara, who has been missing for a year. 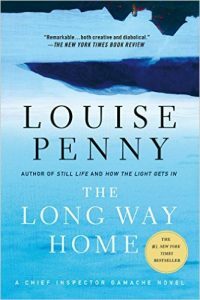 Author Louise Penny is returning to her roots, too, as the first in this series was also about the power of art and psychology of artists. Penny is also experimenting. There is no murder to open the story. In fact, the whole novel revolves around a missing person, which is to say, nothing really happens, and while the first half feels patient and funny, the second half is plodding and so devoid of action that it gets a little boring. Still, the main characters are warm and inviting and after a bit, I’m sure I’ll go on to subsequent mysteries. In 1908 a Jewish immigrant named Lazarus Averbuch knocked on the door of Chicago’s police chief. After handing the Chief Shippy a letter (we never learn what it says), a frightened police force shoots Lazarus several times until he is quite dead. 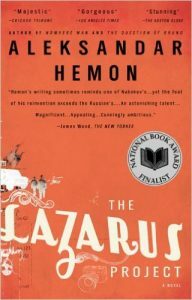 Aleksander Hemon writes one fictional account of Lazarus’s murder, a second of the author’s parallel immigration from Bosnia to the United States, a third about his investigation into Lazarus’s origins in Eastern Europe and life in Chicago’s tenements, and a fourth as a travelogue back to Bosnia taken by the author and a fantastical story-telling companion named Rora. Lazarus dies because deeply anti-Semitic law and order fears anarchists are destroying America and anyone with dark skin, big ears or a nose that might be Jewish is suspect. Immigration to a new country is awful, except it is not as bad as the pogroms that drive you to flee. Getting an author’s grant to take adventures through post-war Sarajevo and rural slavic countries provides good product for a novel, but ambitious, and award-winning as the novel is, the multiple story lines all remain too independent to cohere into a compelling whole.